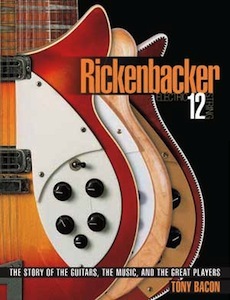 If it’s an electric 12, it really has to be a Rickenbacker. And so it is with this book. Although … it’s not just Ricks. In fact, I talk about the whole history of the electric 12, so there’s also some Fenders and Voxes and the rest (even a Stratosphere). 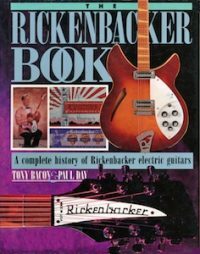 The book grew from my original The Rickenbacker Book (jacket, below), which I did with Paul Day back in 1994, our third volume after The Fender Book and The Gibson Les Paul Book. But now I wanted something a little different, to write a book whose subject is really a sound. The Byrds played a big part in the early days, and George Harrison even more so. It’s all here: those heady times in the 60s, the competitors who tried to match the sound, and the instrument’s continuing life in the hands of countless contemporary players. I did a lot of interviews and had a very enjoyable time rabbiting to Peter Buck, Roger McGuinn, Tom Petty & Mike Campbell, Johnny Marr, Nels Cline, Dave Gregory, Paul Kantner, Jeffrey Foskett, Mike Pender, Marty Willson-Piper, Jim Babjak, Tony Poole, and Robin Guthrie. You can read part of the transcript of my interview with Johnny Marr by clicking on the link here. It was good fun putting the pictures together for this book, too, including actual guitars used by George Harrison, Roger McGuinn, John Lennon, Paul Weller, Dave Gregory, and Mike Campbell, signature models for Pete Townshend, Carl Wilson, John Kay, and Susanna Hoffs, and a cache of unique prototypes and luscious collectables. There’s plenty of snaps of players in action with their 12s, as well, along with some rare memorabilia and candid shots from Rickenbacker’s own extensive archive. All in all, a perfect excuse to get jangling.